Google just got a patent for a special kind of coating on self-driving cars that could help prevent pedestrian injuries. "[The pedestrian] is not thrown from the vehicle, thereby preventing a secondary impact between the pedestrian and the road surface or other object," says the patent, granted on Tuesday. Google (GOOGL) explains that an "adhesive layer" would be placed on the hood, front bumper and front side panels of a car. A thin coating would protect it until an impact occurred. 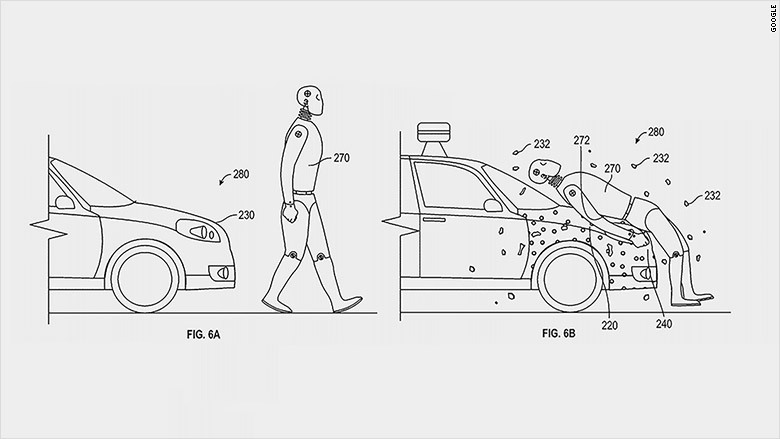 Google patent shows how a self-driving car could protect pedestrians with a glue-like coating. 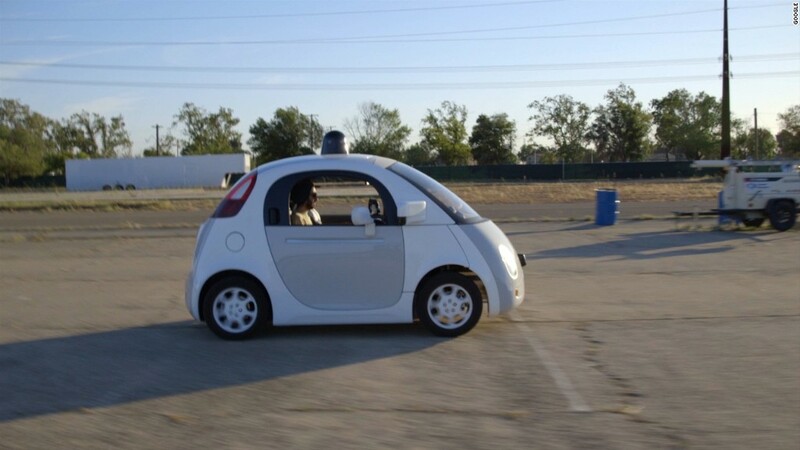 Google's plan for self-driving cars is well known. The company has been testing its vehicles on roads in California and Arizona and is reportedly looking to hire people to test its cars for $20 an hour. The company now has 23 self-driving Lexus cars on the road and 34 of its mini prototype cars. The fleet is traveling about 10,000 to 15,000 miles every week in self-driving mode. Google believes self-driving cars can help people get around easily and safely, but its vehicles aren't perfect. The company says all but one of the accidents so far have been the fault of human drivers in other vehicles. The one accident that Google admitted its self-driving car was responsible for was a fender bender that caused no injuries. Google's ultimate goal is to have a system of cameras, sensors and software that can predict and avoid almost all dangerous driving situations. "However, while such systems are being developed, it must be acknowledged that, on occasion, collisions between a vehicle and a pedestrian still occur," Google said in its patent filing. While the double-sided tape concept could mitigate some pedestrian injuries, the concept is far from ideal if it pinned a victim between the car and another object. "Prospective product announcements should not necessarily be inferred from our patents," a Google spokeswoman said in a statement.